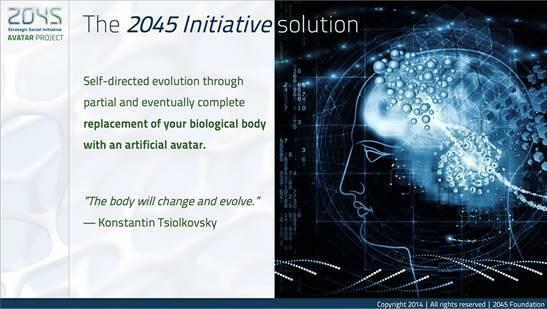 How to build your very own Self-Directed Immortality Avatar for 2045! Mankind has turned into a consumer society standing at the edge of a total loss of the conceptual guidelines necessary for further evolution. The majority of people are almost exclusively absorbed in merely maintaining their own comfortable lives. Modern civilization, with its space stations, nuclear submarines, iPhones and Segways cannot save mankind from the limitations in the physical abilities of our bodies, nor from diseases and death. We are not satisfied with modern achievements of scientific and technical progress. Science working for the satisfaction of consumer needs will not be able to ensure a technological breakthrough towards a radically different way of life. We believe that the world needs a different ideological paradigm. Within its framework it is necessary to form a major objective capable of pointing out a new direction for the development of all mankind and ensuring the achievement of a scientific and technical revolution. The new ideology should assert, as one of its priorities, the necessity of using breakthrough technology for an improvement of man himself and not only of his environment. 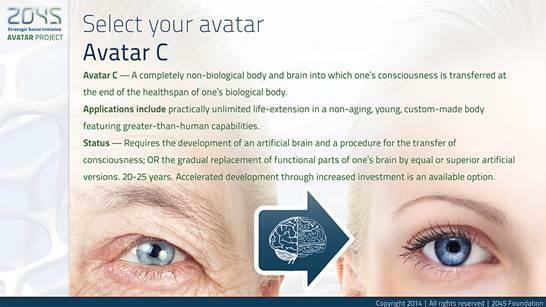 We believe that it is possible and necessary to eliminate aging and even death, and to overcome the fundamental limits of the physical and mental capabilities currently set by the restrictions of the physical body. Scientists from various countries in the world are already developing technology that ensures the creation of an artificial human body prototype within the next decade. 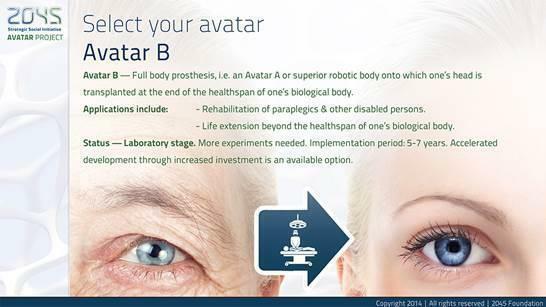 We believe the biggest technological project of our times will become the creation of such artificial human body and a subsequent transfer of individual human consciousness to such a body. Implementation of this technological project will inevitably result in an explosive development of innovations and global changes in our civilization and will improve human life. 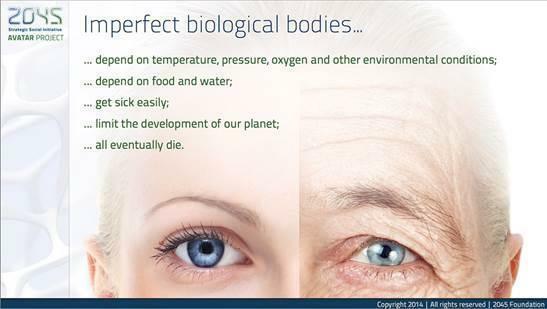 We believe that before 2045 an artificial body will be created that will not only surpass the existing body in terms of functionality, but will achieve perfection of form and be no less attractive than the human body. People will make independent decisions about the extension of their lives and the possibilities for personal development in a new body after the resources of the biological body have been exhausted. The new human being will receive a huge range of abilities and will be capable of withstanding extreme external conditions easily: high temperatures, pressure, radiation, lack of oxygen, etc. 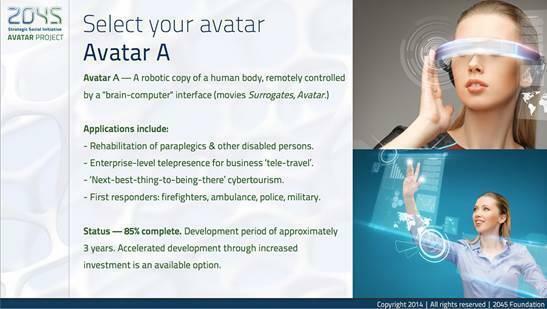 Using a neural-interface humans will be able to operate several bodies of various forms and sizes remotely. We suggest the implementation of not just a mechanistic project to create an artificial body, but a whole system of views, values and technology which will render assistance to humankind in intellectual, moral, physical, mental and spiritual development. We invite all interested specialists: scientists, politicians, mass media personalities, philosophers, futurologists and businessmen to join the "2045" strategic social initiative. We welcome all who share our vision of the future and are ready to make the next jump. 1. 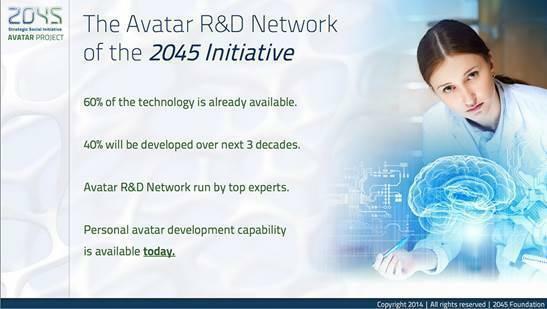 To achieve the support of the International community and create conditions for international co-operation of interested specialists around the "2045" Initiative. 2. 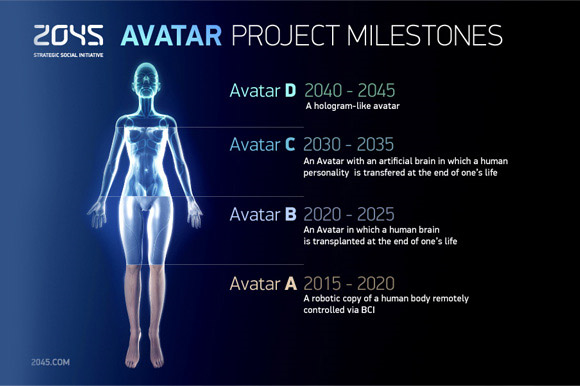 To create an international research center for cybernetic immortality to advance practical implementations of the main technical project – the creation of the artificial body and the preparation for subsequent transfer of individual human consciousness to such a body. 3. To engage experts in the selection and support of the most interesting projects in the quest to ensure technological breakthroughs. 4. To support innovative industries and create special scientific education programs for schools and institutes of higher education. 5. To create educational programs for television, radio and internet, to hold forums, conferences, congresses and exhibitions, and to establish awards and produce books, movies and computer games with the view of raising the profile of the initiative and spreading its ideas. 6. To form a culture connected with the ideology of the future, promoting technical progress, artificial intellect, “multi-body”, immortality, and cyborgization. Are you of sound mind so as to bear legal responsibility for your actions? 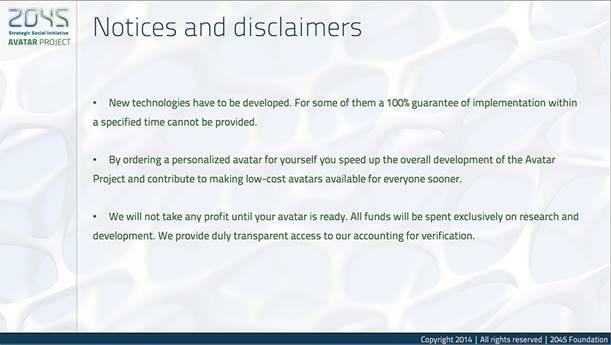 Do you personally -- yourself or as legal representative -- dispose of the funds required for the development (> $3M) for your avatar? Have you decided to commission the development of your custom-made immortal avatar?